Pink sponge was damp, it looks bigger than the dry black sponge. We all know about the hype of using a BeautyBlender to apply your foundation and yes I got in sucked into the whole puff and finally tried the Original Beauty Blender. Before this came along, I'm always finger for foundation type of girl. Never really used a brush for my base, tried it with a few brushes but never really like the finishing of it. 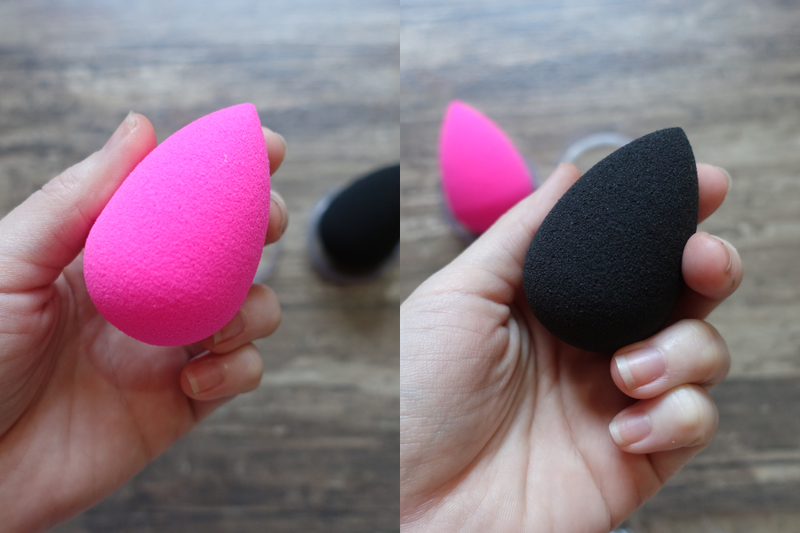 With a BeautyBlender, I felt like I've known how to use it even before I got my hands on it because I've watched ample video tutorials where the YouTubers use this sponge to do their makeup. 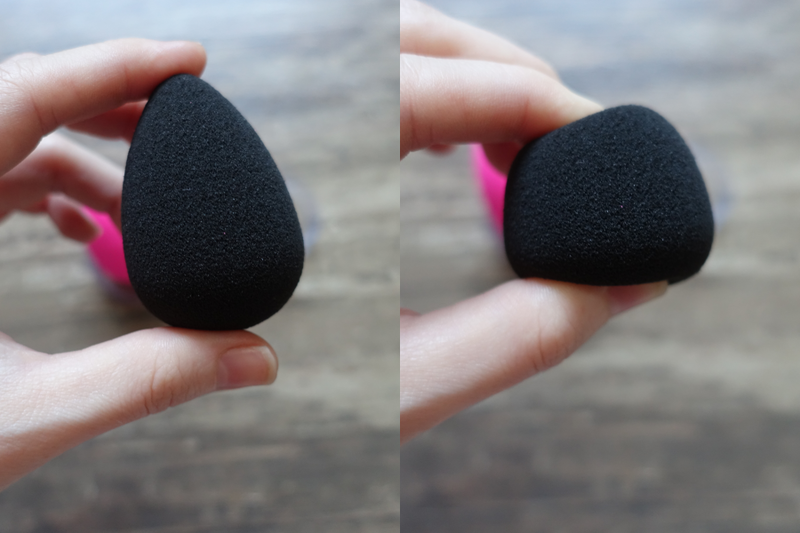 There are so many tips out there on how to use a BeautyBlender, thus I'm not even going to attempt to teach you how I use it because you've probably heard it so many times before. Though, I do have a video coming up where I actually used the pink BeautyBlender to apply my latest favourite Bourjois City Radiance foundation. I believed I literally went "OMGOSH, THIS IS SO GOOD" on the sponge. However, I don't deny that when it first arrived, I went "Huh, why so small?!" It's seriously so much smaller than I thought. I mean, you are paying so much for a small egg-like sponge! Even my fiancé thinks it's ridiculous. Just like everyone else, I soak it in water. 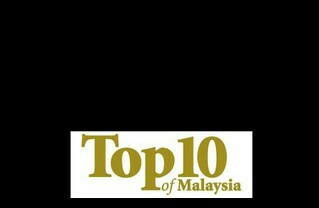 Watching it grow bigger was truly comforting and it was quite fun to keep squeezing it like a stress ball. Then it hit me, when used it on my face, I literally have an epiphany! It felt so good on my skin! I couldn't let it go, I just want to keep patting the sponge on my face! Using a damp sponge feels so refreshing to the skin. The finishing was rather spot on mentioned by other beauty guru. It doesn't leave any streaks like a brush would do, foundation feels light on the skin, not too cakey, and it seem to really push the foundation into the skin to make sure it doesn't bug throughout the day. I like it, I really do like it. If anything, the only down side is that, I have to keep washing my sponge after every application, which is kind of a drag as I'm just lazy but I do it anyways to ensure it's clean before touching my face. I only wash it when I want to use the BeautyBlender cause I needed it to damp anyway, makes load of sense to me. Also, I'm having a hard time cleaning my sponge, I can't seem to get the foundation stain off my pink sponge no matter how well I clean it. It's like going to be forever there, stained. :( Oh well, still works. According to the website, the black one is really no difference to the pink one. Black sponge was made to apply darker coloured products, so it won't look as dirty as compared to using the pink sponge. Both BeautyBlender are available in Sephora at RM99 each. For more information, visit the direct link to the Original BeautyBlender on Sephora website here!